The hope for a hot bluegill bite is what keeps many anglers jigging throughout the winter months, but even when conditions are not ideal, you can catch more bluegills through the ice with some simple tips. 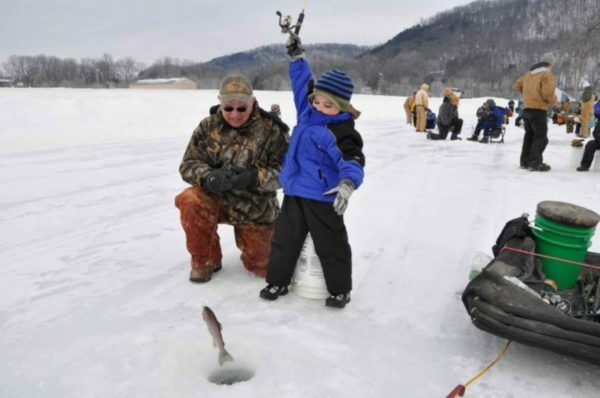 Here are five things to keep in mind when ice fishing for bluegill. Among the most important tips for catching more bluegills this winter is to understand what the fish are feeding on. In lakes with abundant food sources, bluegills will likely focus their feeding on insects, because fertile lakes are typically rich in insect life. However, in lakes with limited sources of food, insects may be in short supply, meaning bluegills will be focused on other food sources – most commonly minnows. The best way to identify what bluegills are feeding on is to examine the stomach contents of the fish you catch. This will let you know, without question, what types of baits will work best. The best strategy for bait selection, when it comes to winter bluegills, is to use smaller baits, especially when the fish are feeding on insects. Even big bluegills will be focused on tiny food sources and using larger baits will likely end in disappointment. The exception is if the fish are feeding on minnows. Then a live minnow or minnow imitation, such as a small spoon or jig, is the most effective approach. You can also try larger baits if nothing else seems to be working. When you are jigging baits through a hole in ice, it may seem an unlikely time to think about fly fishing, but flies can be very effective winter baits for bluegills. Since they are often feeding on insects, nymphs such as a pheasant tail, hare’s ear or prince nymph can be irresistible to hungry bluegills. This approach can give you an edge over other anglers, because it is an offering they are not used to seeing. Make sure to use weighted versions of these flies so you can get them down to the level of the fish. For best results, it is important to target congregating bluegills. When focusing on concentrations of bluegills, you improve your odds of catching fish and for a sustained bite. Often, in large groups of sunfish, you will find actively feeding fish and those that are not feeding. This can keep you catching fish for hours, because those that are not feeding at the moment will likely be feeding later. Within a congregation of sunfish, you are likely to find suspended fish and those that are holding to cover or are near the bottom. The fish you want to focus on are the suspended fish, because they are the ones that are most likely to be actively feeding. Try approaching suspended fish from above, because bluegills often feed on foods that are above them. However, you can also trigger a bite by going just below the fish, because unlike some other game fish species, bluegills can see food that is beneath them.